What is "Portraits with a Purpose"? Growing up I watched my parents give back time and time again. Seeing them do this from an early age and still through today has had a tremendous impact on me. I've done my best to follow their footsteps donating to various charities over the years. When my husband and I started having children almost 13 years ago (wow!) we decided that giving back to children in need was most important to us. So, when we had some extra money, we would give to charities that helped children such a St. Jude's. 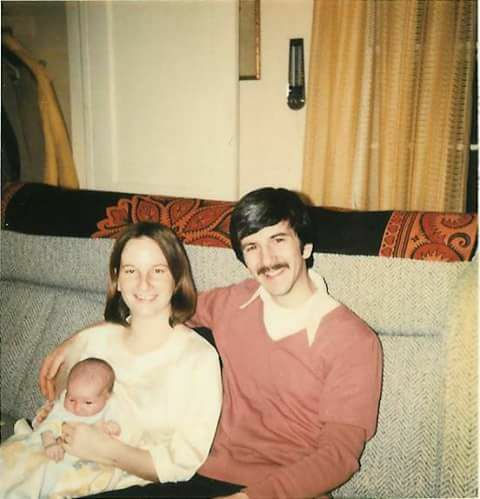 My parents with me in 1978! When I began working more on my business as my three kids entered school, I wanted to start using it a a means to give back as well. I always had great ideas, but they were only successful certain times of the year, before Christmas for example. This was great, but I felt that families needed something more. I've always wanted to contribute more consistently but could never quite determine how to achieve this. With my business growing, including my new studio in Yorklyn, I decided to simplify my product line with amazing new heirloom quality products and provide an even better, more personal customer experience. My high end boutique portrait studio only offers the absolute best in heirloom art to my clients. I still want more for them. I want to give my clients something that no one else is giving them...an opportunity to help me give back, just by placing their order! Portraits with a Purpose is something that has always been on my mind. I am finally at a place in my career that it makes sense to give back in this way, all year long. When my clients place an order that meets or exceeds the "Sponsor Status" I will photograph another family who has a child with a disability or illness, at NO cost to them. They will receive a complimentary session and five 8x10 heirloom quality fine art prints in archival mats, ready to frame and enjoy forever. This complimentary session and product collection is worth $1000, but from what I have learned of families with children who have disabilities and illness, this is priceless. I can't wait to get started. This is my passion, and my focus from here on out, and my excitement is overwhelming.